The listing and price is for ONE STOCKING. We are showing three stockings hanging together in a group so you can envision what a set would look like when you choose some of different colors. Materials: Polyester Taffeta boot body Metallic Sparkle Cuff, Metallic Twist Rope. Fully lined inside with soft polyester fabric insert. Measurements: This velvet stocking measures 19" long along the diagonal from the top of the cuff to the toe; and the width across the cuff is7". Lining: This stocking is fully lined inside. 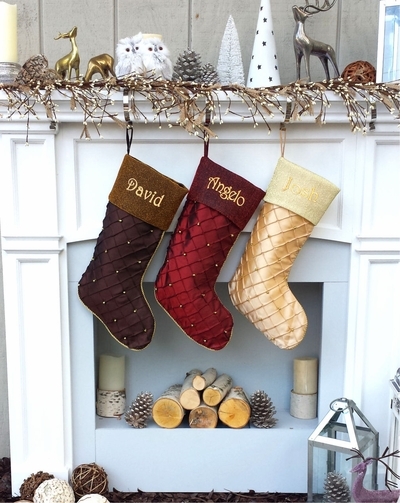 We have a sample picture of the stocking monogrammed with Gold metallic embroidery thread ... click on the thumbnail image in the top right hand corner of this page to see a larger version.